Singapore army’s first chief and Sikhs who have contributed to the armed forces and other uniformed services were the guests at an event that kicked off the week long Vaisakhi celebration. Members of the community gathered at the Central Sikh Temple on April 12 for the Sade Rakhwale Din (Our Protectors Day). The guest-of-honour at the event, which was organised by Singapore-based Sikh youth organisation Sikh Sewaks Singapore, was Brigadier-General (Retd.) Kirpa Ram Vij – Singapore’s first army chief. Vij delivered an address at the event, focusing on his personal story and narrated how he was tasked by the late Dr Goh Keng Swee to set up the Singapore Armed Forces Training Institute (SAFTI), according to a statement from the organisers. Vij then led the 100-strong congregation, which included community leaders such as Member of Parliament Mr Inderjit Singh and current and past servicemen, in reciting Singapore’s national pledge and in singing the national anthem. 1. Kirpa Ram being greeted by guests. Looking on is MP Inderjit Singh (middle). 2. Central Sikh Gurdwara Board president Gurcharan Singh Kesail presenting a momento to Kirpa Ram. 3. Lt-Col (Rtd) Jaswant Singh Gill (white turban), commander of the Singapore volunteer force in the 1960s. 4. Sikh Sewaks’ Harminder Singh greeting Kirpa Ram. Looking on is Ishwar Lal Singh (blue T-shirt) and Brig-Jen (Rtd) Sarabjit Singh (blue turban). Other attendees at the event were Brigadier-General (Retd.) Sarbjit Singh, who retired as Commander of the RSAF’s Air Power Generation Command last year; Singapore’s first naval commander Jaswant Singh Gill, Lieutenant-Colonel (LTC) (Retd.) Daljeet Singh, one of Singapore’s pioneer army officers who saw action during the Konfrontasi, and retired Assistant Commissioner of Police Mr Jarmal Singh. The event marked the beginning of the Khalsa Week, a week-long celebrations organized by Sikh Sewaks Singapore, to celebrate the religious festival of Vesakhi on 14 April – a day that marks the establishment of the Khalsa (Pure) in 1699 by the Tenth Sikh Guru, Guru Gobind Singh. It was the creation of the Khalsa, “which embodied the spirit of courage, discipline and excellence, which lives on” in each of the Sikh servicemen honoured at the event, according to Sikh Sewaks Singapore president Harminder Singh in the same statement. 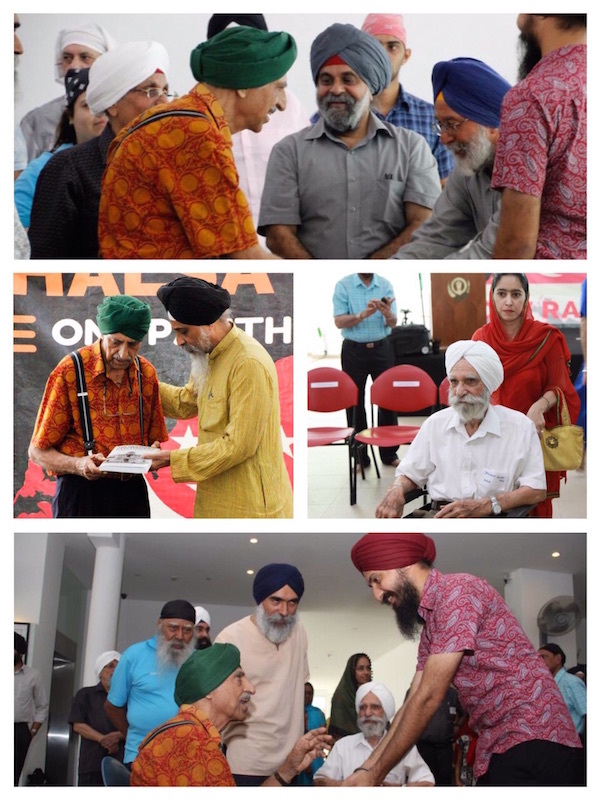 The Sikh community in Singapore has produced many high-ranking officers in the armed forces and police force over the nation’s history, including Major-General (Retd.) Ravinder Singh, who was the Chief of the Singapore Army until last year, the statement added.